I love vintage and have lots of images I printed and ripped the sides for a distressed look. I added lace to the whole card using pva glue. I suggest you let it dry under a heavy object to stop the card from buckling. 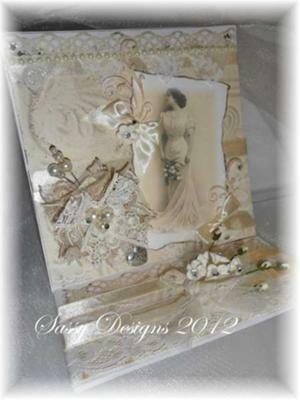 I added an assortment of embellies, ribbons and pearls and kept it to one color (ivories) and a handmade ivory lace. Added rose with pearls to the centre, tiny ivory bows and a couple of hat pins. On the bottom of the easel, I tied a small bouquet and used ivory tulle for the bow to give it a soft feel. What a beautiful card! Absolutely gorgeous. Thank you for sharing.